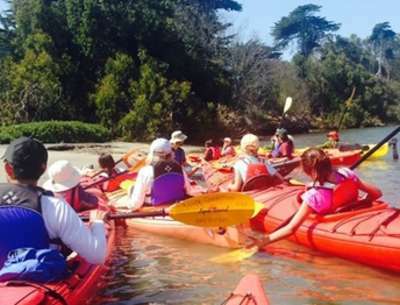 Kayaking on Monterey Bay and Elkhorn Slough is guaranteed fun. It&apos;s not just the adorable sea otters, sea lions and harbor seals, or the soaring pelicans, sandpipers, loons, and grebes, you might catch a glimpse of a see leopard shark or a bat ray. 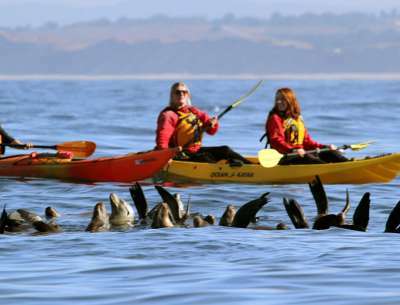 Whether it&apos;s seeing wildlife up close or seeing Cannery Row from the water, kayaking is a great way to spend time with your family and create memories that will last a lifetime. 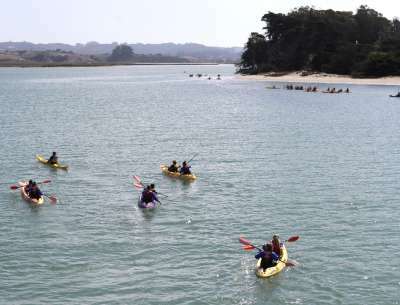 Both Monterey Bay and Elkhorn Slough are calm and sheltered, making them perfect spots for a first kayak excursion. Outfitters such as Adventures By the Sea, Kayak Connection and Monterey Bay Kayaks provide renters with proper outerwear, life jackets, gear and a 10-15 minute lesson before you head out to paddle on the bay. Stay 100 feet away from marine mammals. Wear sunscreen. Though most of your body will be covered by wetsuits or paddling jackets provided by the outfitter, there is still the potential for sunburn on any exposed skin. Wear quick drying clothing. Jeans are a no-no. Wear sunglasses. On a bright, sunny day the light will reflect off the water, making it doubly sunny. If you are prone to seasickness and going out on Monterey Bay, consider taking Dramamine. The small swells can upset the stomachs of the especially motion-sensitive. Don&apos;t expect to stay bone dry. Anything like cameras and binoculars are a ‘bring at your own risk&apos; item.